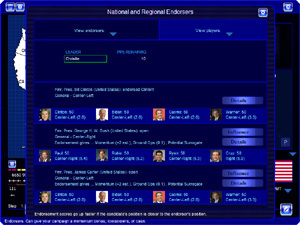 I’m currently working on a new Endorsers Screen, to be included in the next release, probably on Monday. If anyone has suggestions for Democratic-leaning endorsers, feel free to post ideas in the comments. Currently, it’s GOP heavy. Endorsers will continue to be expanded after the next release. They’ll become more nuanced (instead of only caring about one issue or all or them), in particular. 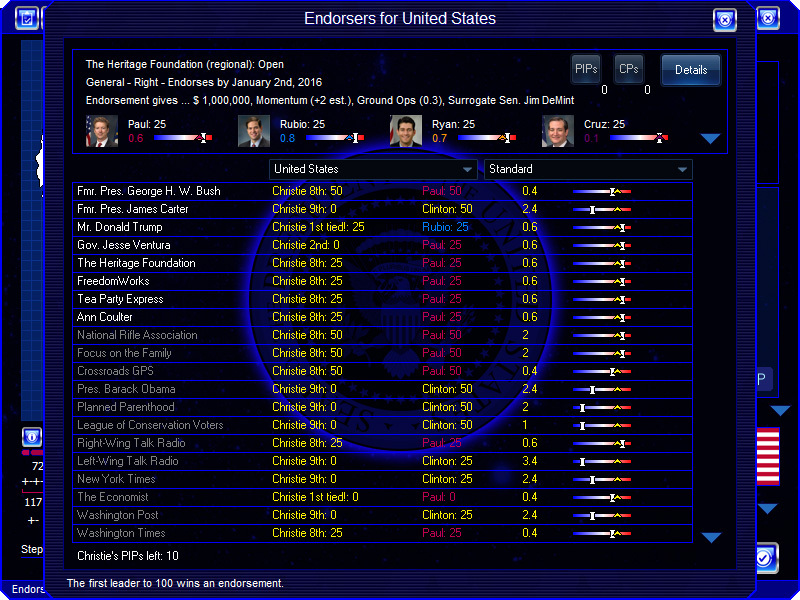 You’ll also be able to sort and view by tags (‘Senator’, ‘Governor’, and so on). There’s people for the American way, council for a livable world, Oprah would have a lot of pull and could make a difference by campaigning. I would also add tom hanks, only because he was recently voted most trustworthy and could maybe use that to influence people. I wouldn’t add too many celebrities though because there’s so many and most are liberals. Maybe in that scenario you used a lot of CP to influence them, but Crossroads GPS should have a bias towards Jeb Bush, and otherwise Rubio, Ryan or Christie. Somebody seen as establishment. HW Bush should also swing towards Jeb, like how Pres. Clinton endorses Hillary. For liberal endorsements, I agree with most of Lucas’s answers and would add Bill Maher and La Raza. Some groups are primarily single-issue, but you’re right that many others needed to be rounded out. George Soros, Warren Buffett, Kennedy Family, American Federation of Teachers, National Organization of Women (NOW), Gay-Straight Alliance, Human Rights Campaign, Sierra Club, Oprah Winfrey. Also, I think Michael Bloomberg should be an endorser if he isn’t “On”. I think GLAAD is bigger than Gay-Straight Alliance but besides that I would replace that those are good ideas. Bloomberg’s Mayors’ gun control group should be on there I think. The Cato Institute for the right. Thanks for these everyone – noted. Will the endorsers screen be in the next update? When do you expect the update to be available? Yes, it will be in the next update. Next release should be tonight or tomorrow. Here’s a good article that should support that the Democrats should have a major advantage at the start of the game. This also shows that moderates are highly unlikely to support Tea Party politicians. It would be nice if there was a way to make Cruz, Paul, etc less attractive of a candidate in the General Election. Nobody has ever won 50 states even in 1964 or 1972 against far from mainstream candidates who weren’t all that impressive personally either so I’ll believe it when I see it. I don’t think it would happen by a long shot. I’m just using it to support that the Democrats should have a sizable lead in the beginning of the game. As crazy as I think Cruz is, I still think Clinton would only get about 350 at best against him. Cruz at best would get 230 EVs. I think Christie is the only candidate that has a chance at beating Clinton. I think vs Biden/Cuomo/Warren/O’Malley, I think Christie, Ryan and possibly Rubio have a shot, but no one else. 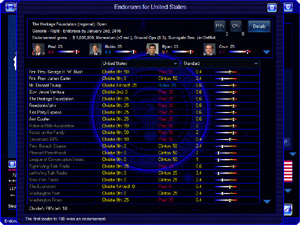 Huntsman would be the wisest choice for Repubs, but he’s leaning towards sitting out now, but he could change his mind.